Fernando Alonso, Lewis Hamilton and Felipe Massa all failed to make it through the first qualifying session in Malaysia after their teams were caught out by rain. Jenson Button also found himself beached in the gravel, although only after setting a time fast enough to get himself into the second session. Fans were treated to a spectacular hour and a half of F1 qualifying after weather predictably interrupted the action at the Sepang International Circuit on Saturday. The first 15 minutes saw Ferrari and McLaren sit out an early downpour only to find conditions getting worse, rather than better. Although Button managed to get a fast lap in before the worst hit, a second tour of the circuit saw him spinning helplessly into the gravel, where he remained until his car was lifted out of harms way. Neither Ferrari driver, nor Lewis Hamilton could put in a fast enough time to drag themselves into Q2 before the time ran out. They were joined by Trulli, Chandhok, Senna and de Grassi all exiting the session early. Conditions improved marginally during the second qualifying session, ending with a more predictable lineup of Petrov, de la Rosa, Buemi, Alguersuari, Kovalainen and Glock finishing outside the top ten, alongside the beached Button. The final qualifying session of the day saw the red flags brought out and a delay to proceedings after cars struggled to complete a single lap in monsoon conditions. After a 17 minute delay, action resumed with a variety of drivers claiming the top spot. 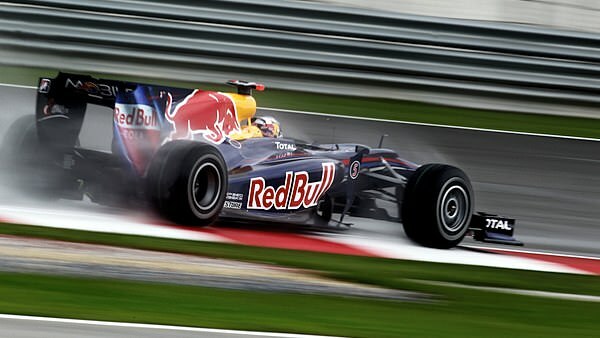 Eventually Mark Webber nailed pole position for the Malaysian Grand Prix on Sunday after gambling on intermediate tyres whilst everyone else ran full wets. Nico Rosberg, the fastest man not on inters, will line up on the front row of the grid beside Webber tomorrow. Third placed man was Sebastian Vettel in the sister Red Bull and behind him Sutil, Hülkenberg, Kubica, Barrichello, Schumacher, Kobayashi and Liuzzi complete the top 10. It was busy and entertaining qualifying session. Formula One needs rain right now, because rain equals entertainment and Sepang saw rivers of the stuff. More is expected for Sunday's race. Bring it on! A list of the days results and times is available, along with a highlights of the session.